Citroën is launching an unprecedented offensive in SUVs in 2017, with the reveal of two new vehicles. Following the unveiling of New C5 AIRCROSS at the Shanghai Motor Show, Citroën C3 AIRCROSS is now stepping into the spotlight! This second, more compact SUV, will launch in Europe in Autumn 2017. Inspired by the C-Aircross concept revealed in early 2017, the Citroën C3 AIRCROSS continues the brand's SUV offensive. Naturally distinctive, its unique styling combines originality with robust strength, reflecting Citroën's DNA and the fundamentals of SUV design. Watch the video. 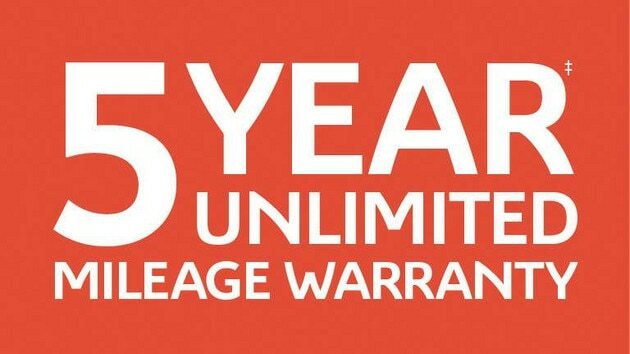 When you buy a Citroën C3 Aircross Compact SUV you can relax with the knowledge that it comes with a comprehensive 5 year* – Unlimited Mileage Warranty covering any manufacturing defects that may arise, helping you enjoy care-free motoring in your new Citroën. Preceede by the C-Aircross concept, the rear quarterlights are made of polycarbonate with a coloured film in the centre, creating a strong graphic contrast on the rear pillar. Adopt an original, high driving position on board this SUV. Dominate the road with this SUV! With its raised clearance, large wheels and Grip Control with Hill Descent Assist, it is ready to take on all types of terrain. With the Citroën C3 AIRCROSS, you can modify the degree of traction to the terrain and control vehicle speed when driving downhill, even on a steep slope. At ease in the city and on the open road, the C3 AIRCROSS makes everyday life easier. In the city, Park Assist technology makes light work of parking manœuvres. The reversing camera with Top Rear Vision provides a 180° rear view of the area behind the vehicle on the 7’’ touch screen. With its tall, ingenious layout, the Citroën C3 AIRCROSS combines class-best interior space with exceptional comfort: 5 seats with generous leg and head room. The exceptionally spacious boot has a capacity of 410L, which can be increased to 520L with the 2/3-1/3 rear bench. For full modularity, the front passenger seat can be folded to increase the load length to 2m40. The C3 AIRCROSS strikes an original stance in this segment, with the muscular lines of its bonnet, which is both short and high. It conveys an impression of robust strength, with a light signature that attracts the eye at both front and rear. At the same time, it is non-aggressive, with its horizontal balance and generous contours. The SUV features Citroën's graphic signature with the layered lights. These lights showcase the expressive front end, with a light signature reflecting the identity of the new brand models. At the rear, the strong shoulders of the C3 AIRCROSS underline its width and strength of character. 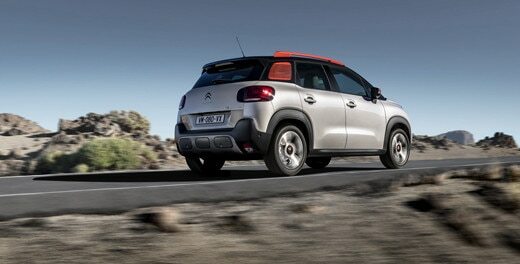 The 3D-effect rear lights bear a family resemblance with the New C3 and C-Aircross concept car. A true SUV, the C3 AIRCROSS features wheel arches with extended wings and black lower sill panels for protection from minor impacts. 85 COMBINATIONS: GO FOR COLOUR ! With its eight body colours, three roof colours and four Color Packs, the Citroën C3 AIRCROSS adapts to your tastes. A full 85 combinations are available. Nothing has been left to chance. The customisation concept extends to every detail: the quarterlights with their shutter effect and the roof bars add to the touches of colour provided by the door mirror housings, headlamp trim and hub caps. The cabin also includes customised features with a choice of distinctive interior ambiences. Five ambiences are available: Grey Mica (Standard), Metropolitan Grey, Urban Red, Hype Mistral and Hype Colorado. Each one has its own distinctive features, similar to those found in fashion or furnishings. You can shake up classic colours or soften contrasts, as you wish. A wide range of wheel designs are also available, with a collection of stylised 16-inch wheel covers and 16" or 17" diamond-cut alloy wheels. Faithful to the Brand's DNA and the Citroën Advanced Comfort® programme, the C3 Aircross benefits from all of Citroën's know-how and provides drivers and passengers with peerless travelling comfort. - sound comfort, with meticulous soundproofing and acoustics. access to which is facilitated by a broad rear window, large-opening tailgate and low loading sill. Strong on everyday practicality, the C3 Aircross also features a removable luggage shelf that can be stored in vertical position behind the rear bench for transporting tall objects. In a further ingenious touch, the dual-height mobile boot floor provides a flat floor with the rear seatbacks folded down. The Hype Colorado design scheme also expresses a premium approach, enhanced by soft-touch materials and special, Colorado-colour upholstery on the half-leather seats, two-tone steering wheel and dashboard. Hype Mistral ambiance is a luxurious choice featuring black leather upholstery combined with a dogtooth pattern fabric and leather effect dashboard trim. The Metropolitan Grey design scheme emphasises cabin space. The focus here is on clarity and travelling well-being with bright colours and warm fabrics that also feature on the dashboard. The air vents have orange surrounds. The Urban Red design scheme expresses vitality and boosts the technological character of the SUV. It comprises a play of contrasts between dark colours and touches of orange colour on the overstitching of the seats in Dark Grey Quartz cloth and the air vent surrounds. The dashboard is covered in TEP. The standard design scheme is pure and uncluttered with a textured grey dashboard combined with Mica Grey cloth seat upholstery enhanced by white air vent surrounds. With the large glazed area (almost one metre in length inside the cabin) and wide opening, the cabin is exceptionally bright and airy, creating a sensation of well-being, whether the roof is open or closed. Two intuitive electric buttons let the driver open the roof or adjust the blind in order to regulate the level of brightness inside the cabin. With the head-up display, the driver can see key driving information continuously without taking his/her eyes off the road. Information is displayed in colour on a retractable panel in the driver's line of vision. The Citroën C3 AIRCROSS features intuitive connectivity. The central console features a dedicated storage compartment for wireless smartphone charging. Compatible smartphone apps are also accessible from the 7" touch screen through the Mirror Screen function, with Apple CarPlay and Android Auto. Equally at ease in the city or on the open road, the Citroën C3 AIRCROSS is convenient for everyday use, and easy to park, with its reversing camera and sensors. Park Assist technology supports parking manoeuvres, making light work of parallel parking or parking at an angle. This function switches between high and low beam depending on traffic, when it detects other vehicles. Driving by night is safer, leaving you free to concentrate on driving. Traffic sign recognition with a recommended speed setting lets you adapt vehicle speed based on the information picked up by the camera. The current speed limit is displayed continuously. The multi-function camera on the upper part of the windscreen detects obstacles, such as vehicles driving in the same direction or at a halt. From 5 km/h to 85 km/h, the sensor works on the brakes automatically if a risk of collision is detected. Equipped with the Grip Control® system for improved traction and special 16-inch and 17-inch mud-and-snow tyres, the C3 Aircross offers a highly modular drive and adapts to all types of roads, whatever the conditions and surface. .
Safety is enhanced in all circumstances through five driving modes. Drivers can leave the Grip Control system on automatic via Standard mode or select between Sand, All-Road, Snow or ESP OFF modes. Combined with Grip Control®, the Hill Assist Descent function maintains the car at a reduced speed even on steep inclines.. This technology keeps the C3 Aircross on the right trajectory while limiting the risk of slippage as the car descends slopes. The Mirror Screen function including Android Auto, Apple Car Play™ and MirrorLink® lets you take advantage of the multimedia content and apps of your smartphone in safety, by duplicating them onto the 7-inch touch screen for easy use. This new-generation navigation function comes with connected services such as TomTom Traffic, for real-time traffic information, service station and car park location and prices, weather forecasts, and a local point-of-interest search function. An EAT6 automatic gearbox linked to the Stop & Start function is available with the PureTech 110 petrol engine.